Vernon Maxwell was born on the 12th September 1965, in Gainesville, Florida USA. He is a former professional basketball player who played in the NBA between 1988 and 2001 in the position of shooting guard. Apart from his achievements in basketball, he was also famous for his erratic behaviour in public and his confrontation with the law, as he was arrested eight times in ten years. Nicknamed Mad Max he experienced a great success in the line of three. Maxwell is one of a few players who managed to score 30 points in a single quarter of a game and in that match against Cleveland in January 1991, he scored 51 points in total. How much is the net worth of the former basketball player? It has been estimated by authoritative sources that the overall size of Vernon Maxwell’s net worth is as much as $4 million, as of the data presented in mid-2016. To begin with, Vernon Maxwell was educated at Buchholz High School where he represented in the Buchholz Bobcats basketball team. As a senior, Maxwell was elected Mr. Basketball in the state of Florida, and was also named All-State defensive back in American Football. He subsequently averaged 20.2 points in his senior season at the University of Florida, and left school after four years as the top scorer and the second leading scorer in the Southeastern Conference after Pete Maravich in his college career. Concerning Maxwell’s professional career, he was picked 47th overall in the second round of the NBA Draft 1988 by the San Antonio Spurs. He played in the above mentioned team for two seasons and was then traded to Houston Rockets, where he became a key member of the team. Known for his shot-making, Vernon Maxwell was also known as hot blooded player, and little by little he acquired a reputation as a fighting player, even mentioned on “The Late Show with David Letterman” in 1994. Because of this reason, he was constantly traded from one team to another, although his net worth continued to rise. So Maxwell played with the Philadelphia 76’s (1995 – 1996), San Antonio Spurs (1996 – 1997), Orlando Magic (1998), Charlotte Hornets (1998), Sacramento Kings (1999), Seattle Super Sonics (1999 – 2000), Philadelphia 76ers and ended his career as a member of the Dallas Mavericks (2001). 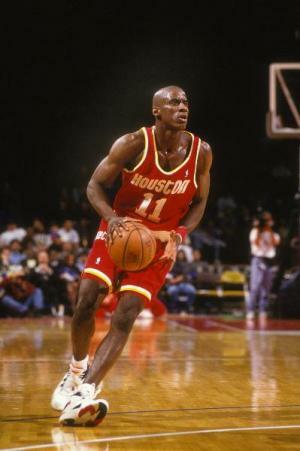 Regardless, Vernon Maxwell was an NBA champion twice in 1994 and 1995 with the Houston Rockets. According to his career statistics, he scored 10,912 points, 2,200 rebounds as well as 2,912 assists throughout his career. Overall, basketball is the main source of Maxwell net worth. Finally, in the personal life of the basketball player, Maxwell has never been married, but has had a number of relationships. In 2003, he was dating the actress Elisabeth Röhm. In 2004, Vernon was in relationship with the model Camila Alves. Two years later, he apparently fell in love with another model Doutzen Kroes who was changed to the model Kris Jacobs in 2009. In 2010, he met the model Selita Ebanks, but since 2013, he has been in a relationship with Lithuanian model Deimante Guobyte.